Not everyone has the money or space for a full smoker. Also, smoking food the traditional takes a long time; you can spend all day babysitting a smoker. It's often faster and easier just to buy a smoker box and set it on your grill. Personally, I like placing the smoker box over the fire and the meat off of the fire. This allows you to cook with indirect heat and lets the meat absorb the smoke for 30-45 minutes, depending on how hot you cook. When the meat's almost done, you can toss it on the high heat side and get the char-grilled flavor as well. This gives you perfectly grilled meat with smoke flavor. This simple smoker box from Cave Tools takes it back to the stone age. Its thick stainless steel material prevents warping. Also, its easy-access hinged lid lets you add wood quickly and keeps you from burning your hands (you'll probably still want to use gloves, though). You can fit this smoker box under a grill grate or even on top of burning charcoals. The Cave Tools smoker box comes with 25 professional recipes that you can try for yourself. They take you step-by-step through the cooking process. This smoker box is very reasonably priced, especially considering its features. Primarily used for gas grills, the Charcoal Companion smoker box will help you get that powerful wood-smoked taste. Made with stainless steel, the box shouldn't break down anytime soon. However, a few people have complained that it rusts quite easily. 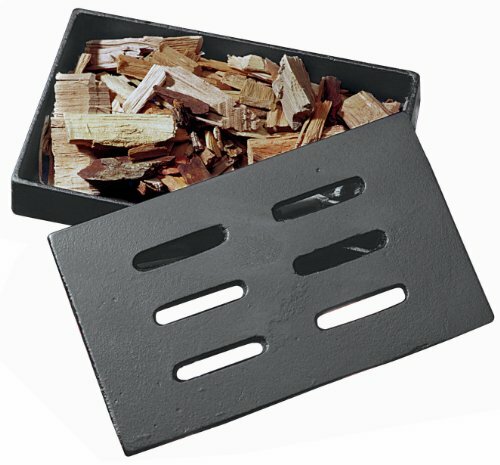 The Charcoal Companion also has a hinged lid, which makes it easy to access and rearrange your wood chips. The box comes in two sizes: Short and long. This smoker box's unique V-shape allows you to fit it in the tiniest of the spaces, making it convenient for a variety of smokers or grills. If you despise cleaning with a passion, the Charcoal Companion makes it relatively painless by storing ashes inside. You can just dump the ashes out when you're done cooking. If you need something on the durable side, this smoker box from Char-Broil will fit the bill. The lid and body of this wood chip smoker box are made with cast iron that won’t rust or break down. 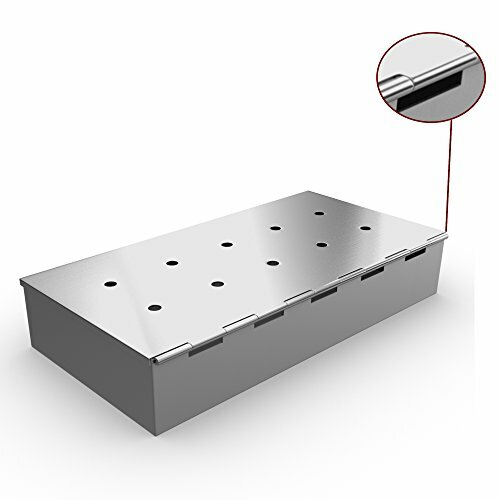 The smoker box's lid has holes that allow oxygen to come in without starting a second fire. Like many other smoker boxes, the Char-Broil is very affordable. Since it’s made with cast iron, it can take a beating from any heat source without becoming seriously damaged. Be warned, though: It could take a long time to get the box hot. This has been a common complaint from buyers, so if you’re usually impatient, you might look for another product. The GrillPro brand offers two wood chip smoker boxes, one made with cast iron and the other made with stainless steel. Both materials are extremely durable, so you can cook several times without damaging the boxes. The biggest difference between the cast iron box and the stainless steel one is the air holes. The cast iron version has longer, oblong holes while the stainless steel version has 8 small holes on the lid. The cast iron smoker box may have better ventilation, although it's not absolutely certain. With the Grillpro smoker boxes, cleaning is quick and easy. When you’re done cooking, you can just dump any ashes out of the box and wipe it down. With a name like Grillaholics, you know that this brand takes outdoor cooking seriously. 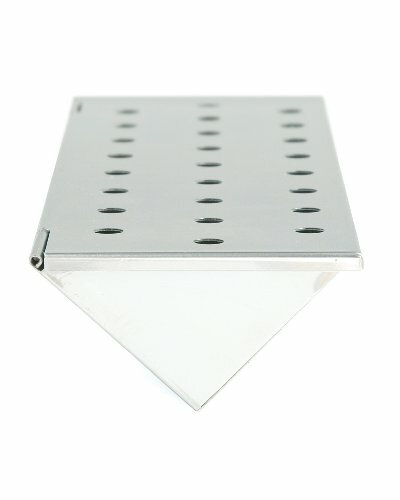 Their stainless steel smoker box has plenty of holes for efficient ventilation. You can just add wood chips and let them burn. By allowing small amounts of air to access the wood chips, the smoker box builds a consistent level of heat and creates a strong smoke presence. No matter which type of flavor you add to the wood chips, this product has a lot of potential. The Grillaholics stainless steel smoker box is more expensive but not by much: You can find it for a little over $20. This smoker box does have some issues, though: A few customers have complained about their lids warping and becoming extremely damaged. Choosing the best wood chip smoker box can be hard, since they all look more or less alike. The main thing you want is durability. Cast iron and stainless steel both hold up well under extreme heat, but each manufacturer makes their products differently. This can impact how many times you can use a particular box. In terms of durability, your best bet will probably be the one from Cave Tools. Its stainless steel is 25% thicker than standard smoker boxes, which helps prevent warping. 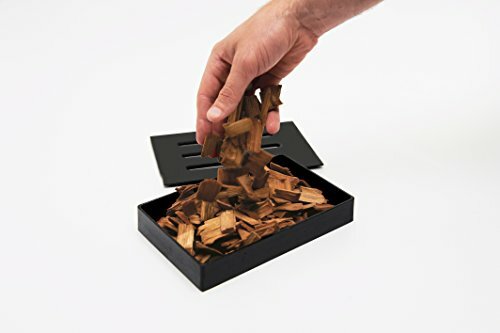 If you’re big on convenience, the V-shaped wood chip smoker box from Charcoal Companion is a great option. Both the long and the short versions can fit perfectly in most deflector bars on grills. You just need to put the wood chips inside and set the box down. All smoker boxes are fairly cheap, so price isn't a big factor. You can buy flavored wood chips separately if you feel so inclined. 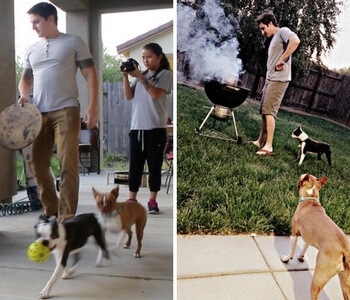 Sometimes, just grilling isn't quite enough. To get the true smoked flavor that you want, you might consider investing in a wood chip smoker box. People use smoker boxes to avoid tossing wood chips directly into a fire. You can add either dry wood or soaked wood. Most people prefer soaked wood because it tends to burn longer. However, others argue that soaked wood chips only create steam and prolong the cooking process. If you choose to soak your wood, you should do it for at least 30 minutes. You could add other types of liquid like beer or wine to give your food a more unique flavor. You can also choose from a variety of special wood chip flavors (hickory, mesquite, even pear). I personally use pellets in my Amazen smoker. Wood chip smoker boxes are typically made from stainless steel or cast iron. Stainless steel tends not to rust as quickly while cast iron holds up well under high temperatures. Which material you'll want is largely a matter of personal taste. 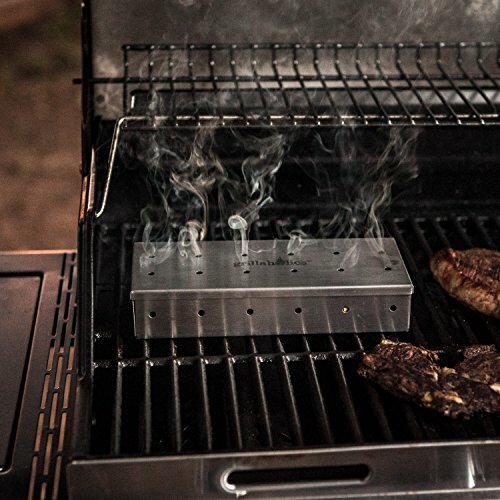 From the standard rectangular box to the V-shaped products, these devices will help give your food a strong, smoky taste regardless of the grill or smoker you’re using. If that's the taste you crave, a smoker box will be a worthwhile investment.